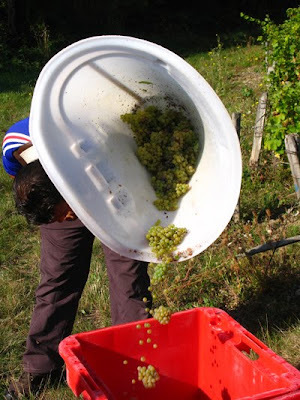 2009 Muscadet: what a difference a year makes! 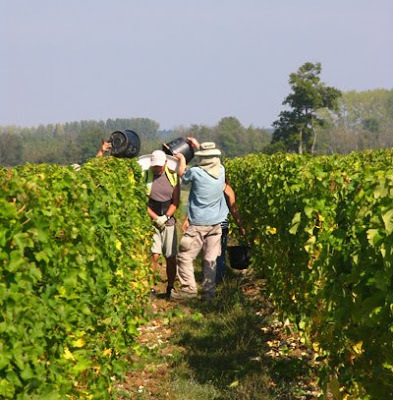 After the very small 2008 vintage, due to frost on 7th April 2008, the producers of Muscadet are delighted to have a normal harvest of generally high quality due to the exceptional weather in August and September. 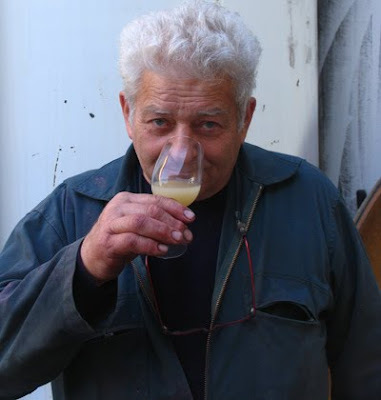 Pierre Luneau unable to contain his delight with the 2009 vintage! 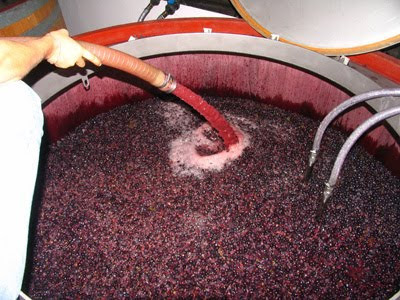 This year the vats are full, while last year they were far from full. 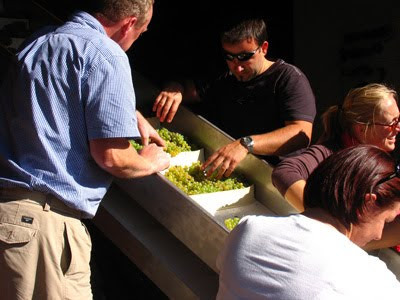 On a flying visit to Pouilly on Tuesday morning the producers I saw were very pleased with the quality of grapes they were harvesting. 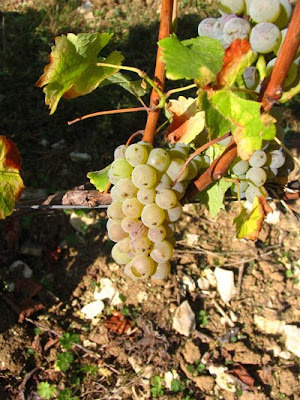 Most had higher yields than those in the vicinity of Sancerre, although some are still suffering the consequences of last year’s hail. 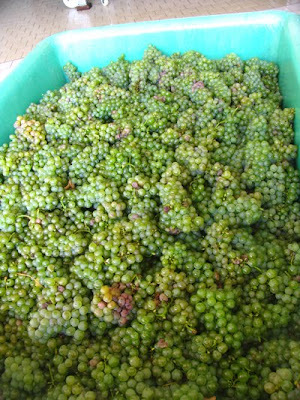 The only Pouilly producer I saw who had been hit by hail was Henry d’Assay. 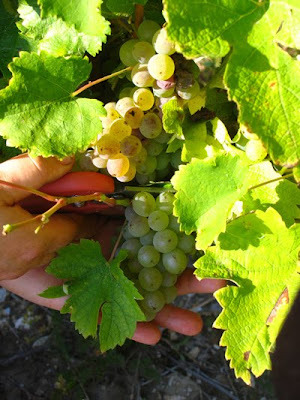 “Because of the hail around the château we have only 30-35hl/ha overall. We started on 18th September and we will finish tomorrow. When the started the potential was 13.5% but it is now up to 14%-14.5%. 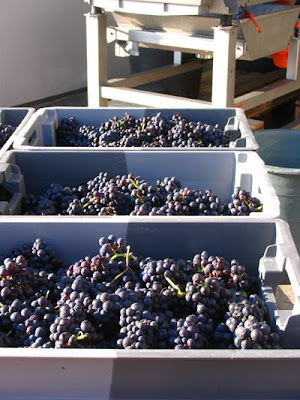 The harvest continues in brilliantly warm, sunny weather. 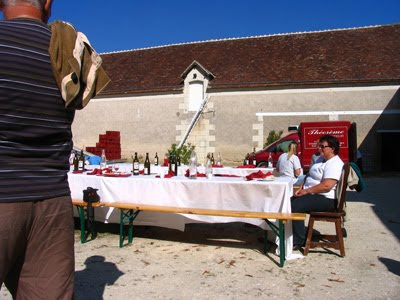 Indeed it is almost too warm – it touched 27˚C around 3.30pm – as the potential alcohol is shooting up. 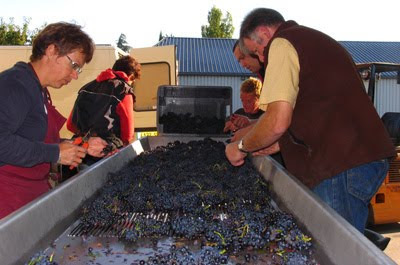 Very few producers that I have seen are bringing in either Sauvignon Blanc or Pinot Noir at under 13% and there are stories of someone picking a parcel at 15.5%. 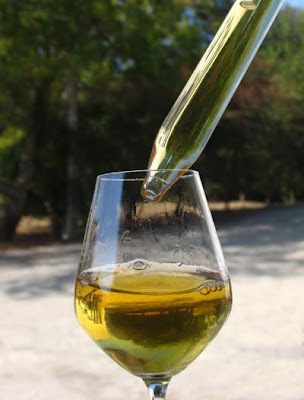 Fortunately the acidity levels are reasonable – mainly between 4.5-5.5 g/l. 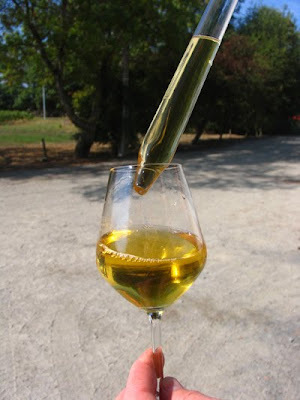 I have tasted the juice in a number of chais and although rich, it appears well balanced with a freshness in the finish and good aromas. 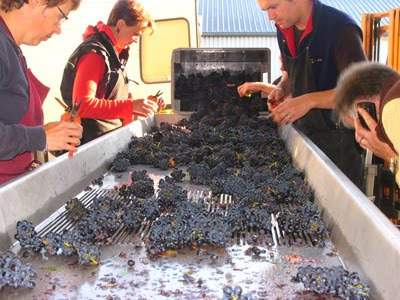 Certainly all the juice that I have tasted here is very clean – there is hardly any rot around, expect for those vines hit by hail. Hail and its effects is really the big story here this year. 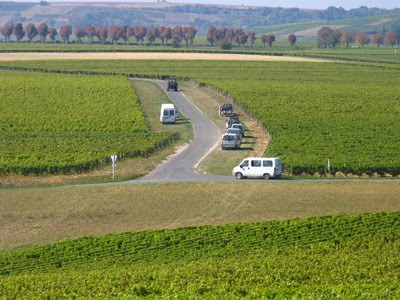 Like Menetou-Salon the vineyards of Sancerre, Chavignol and Bué were hit by three successive hailstorms – two in May and one on 16th July – the day after the Tour de France passed through the region. 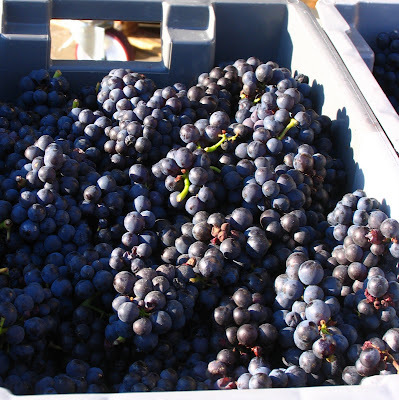 Although the recent good weather has produced very high quality grapes, producers hit by the hail will make much less than normal. 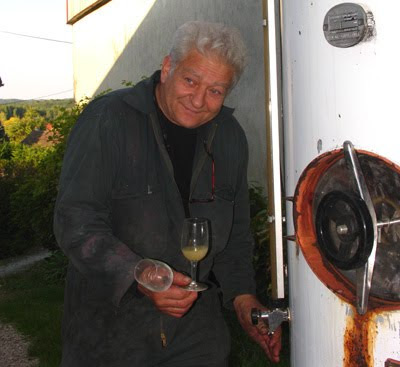 Some of Sancerre’s best-known names have been hit badly. Overall it looks likely that the Vacherons will be down in the low 20s hl/ha. 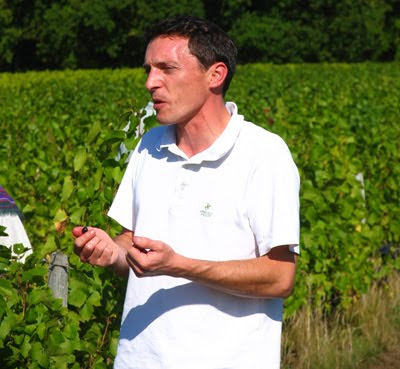 Jean-Michel Fouassier reports 20hl/ha average in those vines hit by hail and only 35 hl/ha elsewhere due to a petite sortie and poor conditions for the Sauvignon during the flowering. This compares to 45hl/ha last year. 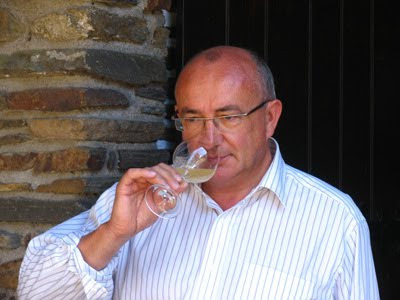 “30 hl/ha,” says Jean-Marie Bourgeois. 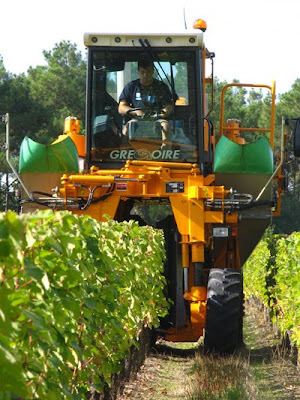 For Jean-Max Roger in Bué it’s around 25hl/ha, while for both Gilles Crochet (Lucien Crochet) and François Crochet the Sauvignon yield is around 30hl/ha, with Pinot Noir in the region of 35/40hl/ha. 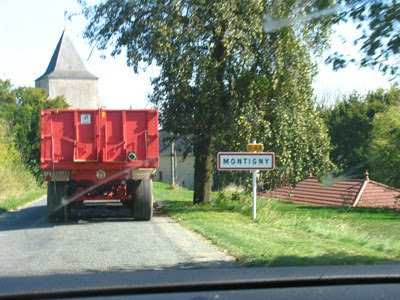 For Les Alphonses (Alphonse Mellot the yields are between 25-35 hl/ha depending on the parcel but as Alphonse junior points out this is about a normal yield these days for them." 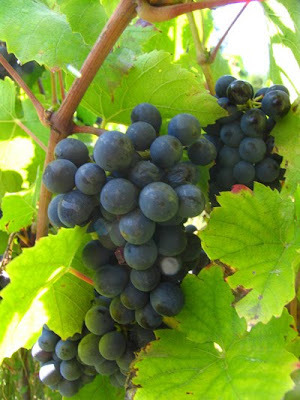 As the Pinot Noir flowered earlier, it was less affected by the poor weather in June that disrupted the Sauvignon Blanc flowering. 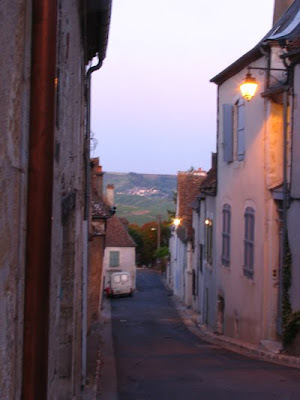 Still brillant weather in Sancerre. Having problems connecting to the internet. Hopefully resolved soon. 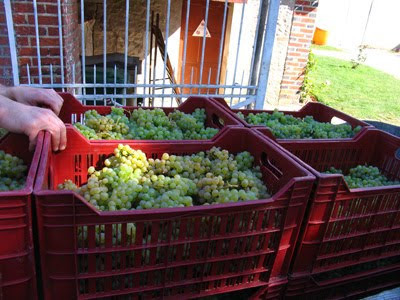 In the meantime, here are some pictures of the harvest in and around Sancerre. 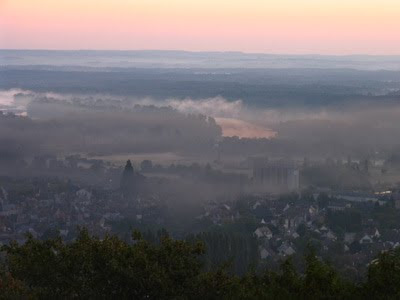 Arrived in Sancerre yesterday afternoon to spend Monday and part of Tuesday here and in Pouilly-sur-Loire before heading off to the Pays Nantais to catch the vintage there. I was up early to see the teams of pickers set off. 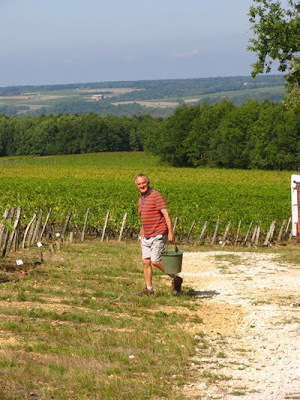 Firstly dropped by the Vacherons, who are very happy with the quality but volume is very small due to the succession of hailstorms during the year, especially the third on 16th July. Next to Alphonse Mellot where I saw Alphonse Père as he was setting out with the team of pickers. "Enorme," was his verdict on the quality but wishing there was more. Like the Vacheron the Mellots have been badly hit the hail. 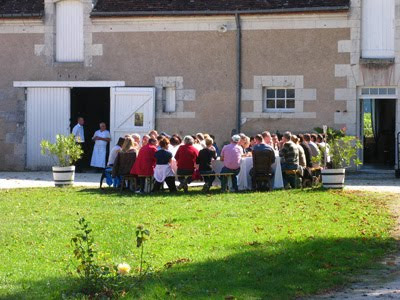 What could be more agreeable than a morning spent picking grapes in the warm Touraine sunshine, lunch in the courtyard and the afternoon spent either filling the press or back into the vineyard to check whether the next parcel is ready to be picked. 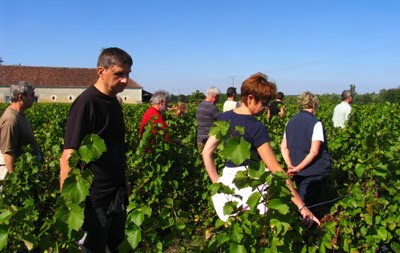 Yesterday Vincent Roussely (Clos Roussely) had some 45-50 people, who have signed up to MesVignes, spending the day with him at the domaine. 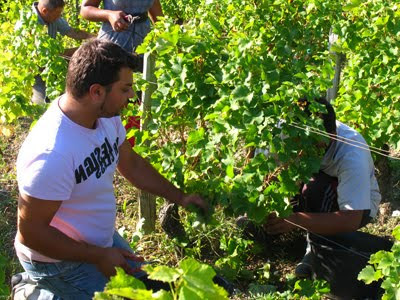 MesVignes is one of a number of schemes that offer the chance to discover what it is like to be a vigneron by buying vines in an established vineyard. 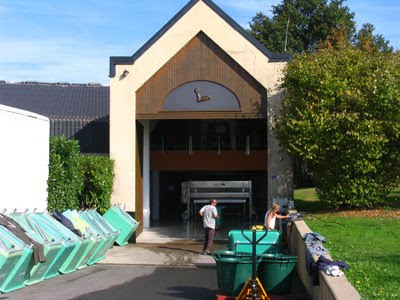 The company has 12 domaines in various parts of France including Bordeaux, Burgundy, Languedoc, Loire and Rhône Valley involved. 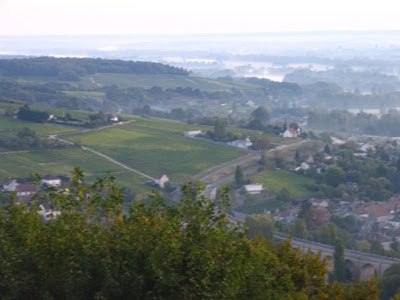 Domaine Fouassier in Sancerre and Clos Roussely are the Loire domaines in MesVignes. 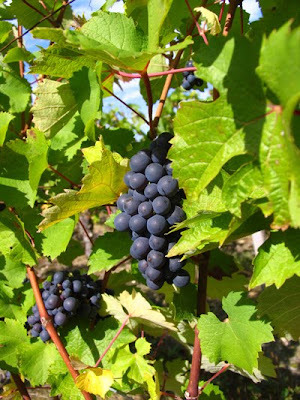 The minimum purchase is 12 vines which gives you 12 bottles of wine (2010 prices). 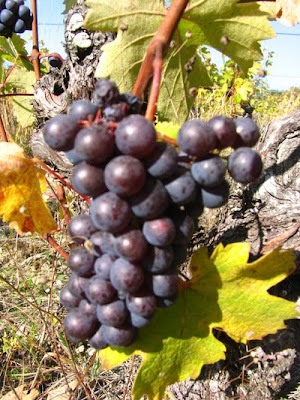 If you signed up for Vincent Roussely's Clos Roussely it would cost 194€ for 12 vines. 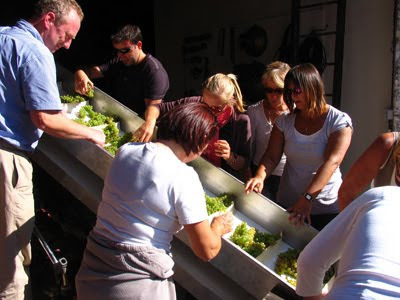 Clients can then sign up for for a day's harvesting with Vincent. 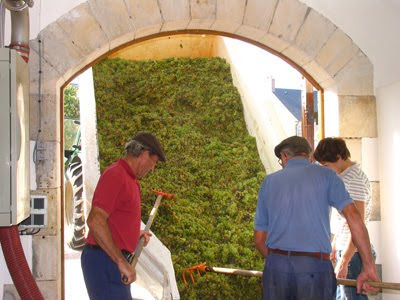 If you choose all the options the cost for 36 vines would be 799€. 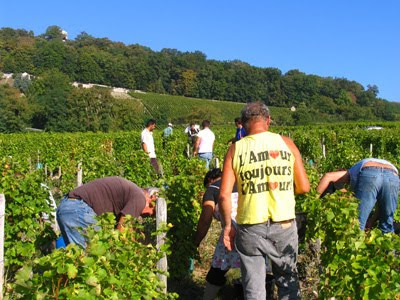 Today Vincent has another MesVignes group, who will be picking Pineau d'Aunis from vines planted in 1905. 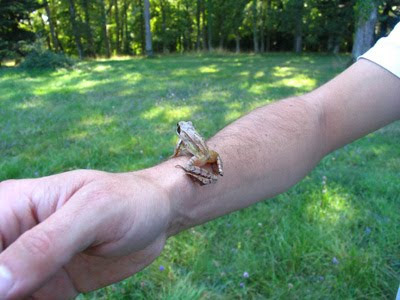 Vincent with a baby frog – will MesVignes have an adopt a frog scheme soon? 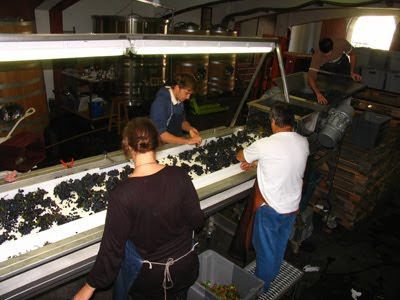 There are several other buy vine schemes including 3D Wines and Wineshare. 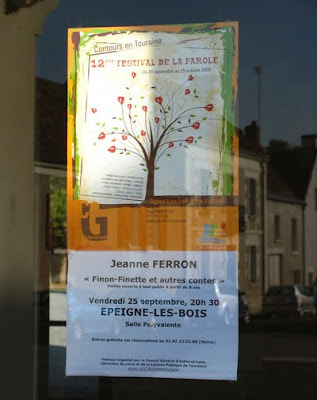 Jeanne Ferron, one of the 14 storytellers employed by the départment of Indre-et-Loire, came to Epeigné-les-Bois and gave a spell-binding performance of storytelling last evening. 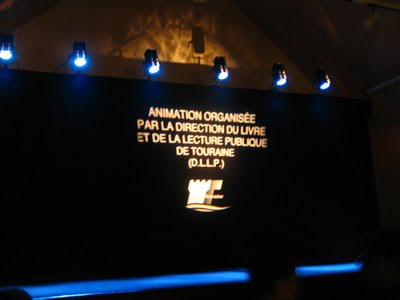 Jeanne's performance, which was part of the 12th edition of the Festival de la Parole, lasted well over an hour. Her main story was called Finon-Finette and involved a king, a randy prince, three princesses in a tower, chastity belts in gold and diamonds that didn't work but a thick glass one (Duralex brand) that did, and two pregnancies. 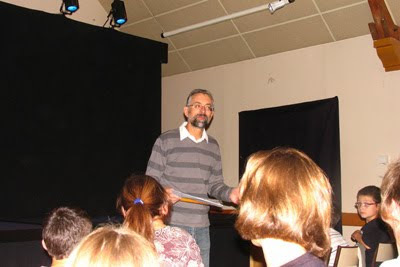 There were just over 80 kids and adults in the audience. On the way back from Quincy dropped into see Jacky Preys in Meunes. 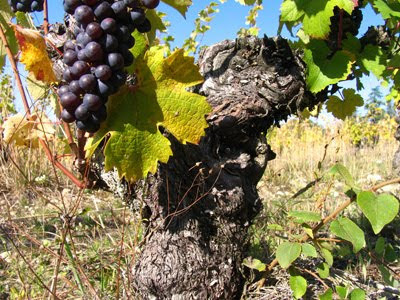 Jacky has 75ha – part in AC Touraine and part in Valançay. 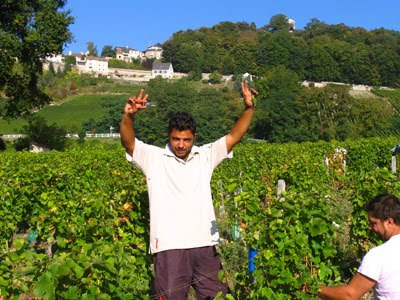 He is delighted with the harvest, although he still has about half yet to pick, especially his vineyards in Mareuil-sur-Cher. Small volume but of high quality. 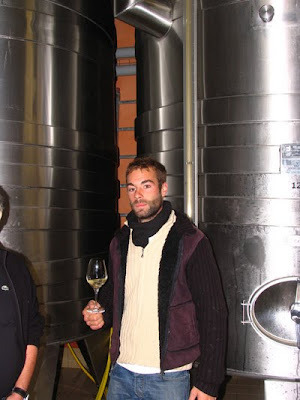 We tasted 2009s from a number of tanks and there was certainly impressive weight and flavour there including his well known Fie Gris (also called Sauvignon Gris or Sauvignon Rose). 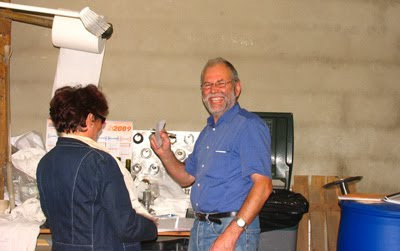 More news of 2009: Jacky Blot, Noël Pinguet etc.